GREENSBORO, NC (March 19, 2019) – Mack Trucks today displayed its second-generation zero-emission capable Class 8 drayage truck at the California Air Resources Board (CARB) Low Carbon Transportation Heavy-Duty Showcase in Sacramento, California. 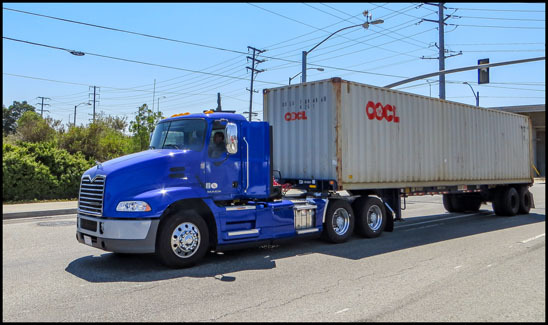 The plug-in hybrid electric (PHEV) truck, which is based on a Mack® Pinnacle™ axle back daycab, has been operating in revenue service with a customer drayage fleet for more than 12 months. Similar to the first-generation truck, the second-generation PHEV drayage truck is capable of zero-emission operation thanks to the integration of a Mack MP®7 diesel engine with a parallel hybrid system and lithium-ion battery pack. Unlike the first-generation truck, which utilized geo-fencing capabilities similar to those enabled by Mack’s GuardDog® Connect telematics platform to switch between zero-emission and hybrid operating modes, the second generation truck relies on an adaptive self-learning algorithm to identify and create zero-emission zones in order to maximize all-electric operation. This innovative, self-learning approach has enabled the second-generation truck to operate in zero-emission mode more than twice as much as the first-generation truck, which relied solely on preset geo-fences. The dramatic increase in all-electric range was achieved with no changes to battery pack size or capacity, or truck performance.